“Okay, okay. Keep your shorts on,” Chuck said tossing the magazine on the battered desk. It landed on top of folders marked ‘New York Yankees’, ‘Apple Computers’, ‘guitar’ and “miscellaneous current stuff’. In piles around the desks were dozens of folders of varying widths stacked in fairly random piles. The phone was vintage 1970s, a bottle of water stood next to a paper plate with a huge sandwich, half eaten and an iPod sat ready on the corner. The chair had seen better days and a book back hung off an ancient coat rack with a denim jacket. Chuck leaned back, straining the chair to it’s limits as he stretched then got up with a groan and a yawn. “What year was that again,” Chuck said as he wandered back into the aisles of the huge warehouse. 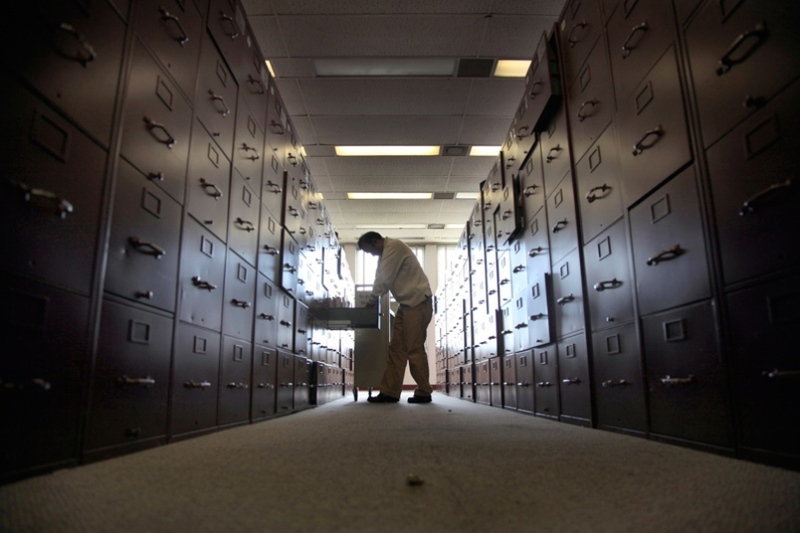 Lights began flipping on over rows of file cabinets dating back to the mid-sixties. He wandered slowly. His boots scuffed the floor and he stretched, yawning in his khaki work shirt and dark olive pants. He ran his hands through his long hair and rubbed his scruffy face. “1986! Come on!” The voice said clearly annoyed. “In Detroit, with Stockwell.” The voice added. “Well that will narrow it down,” Chuck said sarcastically. Most of what was here was connected to Stockwell in some way. “1990, 1989…” He was saying to himself as he went along the row of cabinets. On a few were pictures and stickers from the time. A “Ratt” bandana hung from one of the handles and he pulled it playfully. “Cool.” he said smiling. This was how Chuck spent his days; sitting at the desk getting information for his boss. It was his job to find what he needed, on a moments notice and it could be completely random. Just the other day he somehow came up with the information about how his bosses mother would use a plastic rake to comb the shag carpeting in the old house on Wilshire Avenue in Detroit, when he was a kid. That one just fell into his lap and somehow Chuck and stuck his hand into one of the drawers back in the 1970s file and came up with it. Most of what was needed was in the folders on the desk; computer software, bicycle mechanics, home entertainment system, Blackberry information, Birthdays, Anniversaries, recipes. That stuff was easy, but occasionally he pulled out something that was nearly impossible without some prodding. Chuck’s, and his boss’s, favorite was maybe his earliest piece of information; being woken up and brought downstairs to watch man land on the moon in 1969. He could see that living room on Wilshire Avenue. The TV was near the front door and the door was open because it was a warm July night. That one always brought a smile and goosebumps. Kissing a girl for the first time was right up there, too. Her name was Andrea and she smelled like flowers and tasted like cool, clean water. His days were pretty easy as the information was usually very common. Chuck spent his time looking at his favorite magazines, with Bicycling there was Guitar World and Wired. He perused the newspapers and didn’t mind the occasional catalog. It was easy work, though his boss was demanding at times. “I’m not seeing it,” Chuck called back to the speaker on the desk. “I’ve got plenty for Van Halen on the 1984 tour with David Lee Roth at Market Square Arena, why don’t you just use that for now.” Cautiously he waited for the response. Chuck pumped his fist silently knowing he could set it aside for now. His boss would ask Stockwell and they’d laugh about it. Chuck wandered back up the aisle to his desk. He passed 1987 and those files were immense. The designation ‘NYC’ stood out on the drawers beginning in September. The years after that were all marked with that and he’d accessed them a lot. On some drawers he had made notes for quick reference. Things like ‘Nicole Miller’, ‘Circus Bar’, ‘Elton John at Madison Square Garden’. These files were vital to what was going on here. 1990 was a huge year that contained files about his boss’s wife and daughter. As he wandered back to the latest cabinet marked 2010, it was only a few months old and still mostly empty, he smiled and pulled out his chair. “Damn that’s a nice bike,” he said to himself as he picked up his magazine and sat down putting his feet on the edge of the desk. James is Chuck’s boss and the cabinets are filled with James’s memories.